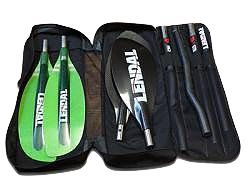 If you take your four piece paddle on trips or if you just want to protect your paddle investment, you will want to have a Lendal four piece paddle bag. Made out of durable ballistic nylon this bag has it all. Compartments for each blade and each shaft piece. Holds two to three paddle systems. Has plenty of storage pockets for your gloves and small paddling accessories.